It’s been a while since I had a look at gold’s movements however with it closing at $1,297 on Friday and the BBC writing articles like this which reported that gold had reached a new high of $1,300.07 during trading before dipping back I thought now was probably as good as time as any to review golds prices. Today I’m going to look at its prices in British Pounds though, rather than US Dollars, as this is the currency that matters for me. This is because I’m based in the UK and earn in the UK which makes my portfolio a GBP portfolio in my humble opinion. Friday’s gold price of £819.06 is not however a new high when looking in nominal terms in GBP’s using historical monthly prices courtesy of the Bank of England. That honour goes to June of this year where the monthly gold price was £835.39. 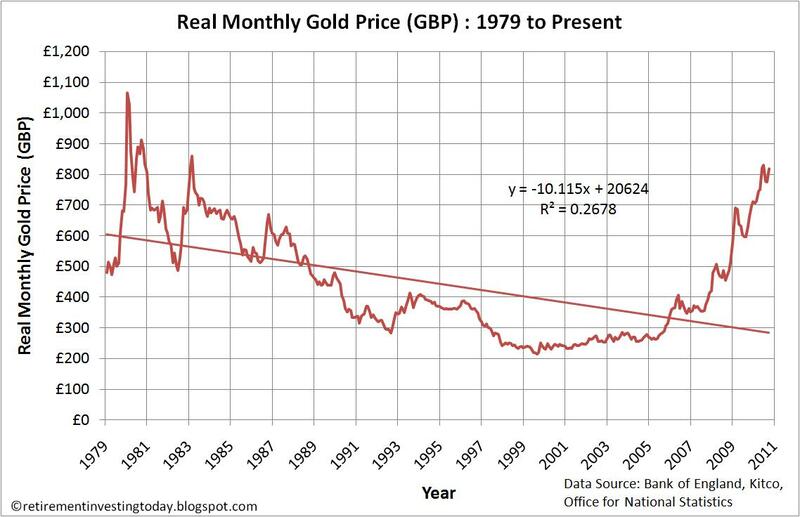 Of course for those, like myself, who always look at gold prices in real (inflation adjusted) terms you will see that gold when priced in GBP is nowhere near new highs. Looking at data since 1979 that honour goes to 1980 where real prices reached £1,066.35 which is still 23.2% higher than we are seeing today. Second place still goes to 1983 with a real price of £859.39 which is now only 4.69% above Friday. This can all be seen in today’s first chart. 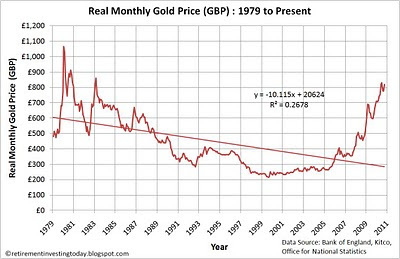 On the other hand the trend line of the chart suggests gold today at only £285.26 and the historical average real gold price from 1979 is £445.31. So by both these measures gold currently looks over priced in GBP terms. 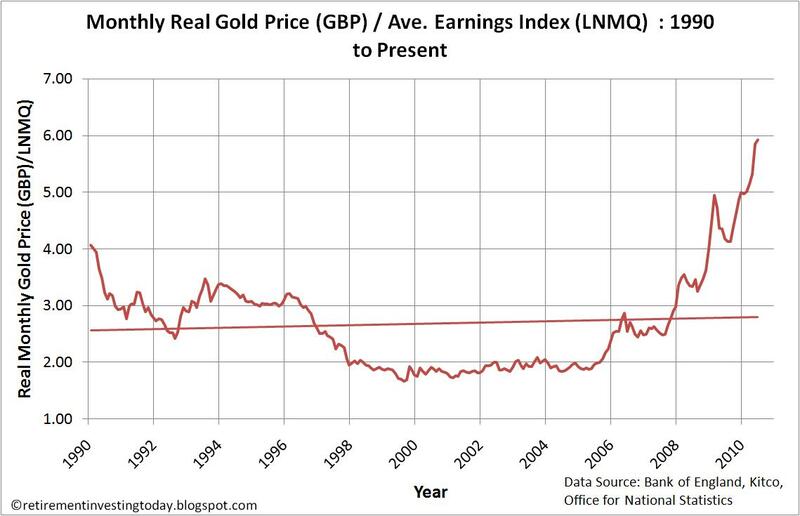 My second chart today shows the price of gold in GBP divided by the seasonally adjusted average earnings index for the whole UK economy (LNMQ) since 1990. 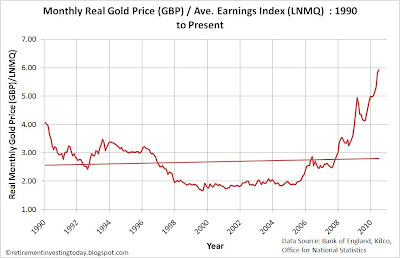 This ratio shows that gold was ‘cheap’ between 1998 and 2005 (remember Gordon Brown sold 400 tons of the UK’s gold reserves between 1999 and 2002 in a series of auctions). In earnings terms gold is as of June 2010 (the latest available data for LNMQ) 3.6 times more expensive than the low of that period and continuing to rise. So what am I doing with my gold holdings which currently make up 5.1% of my portfolio? The answer is simple. Nothing. I haven’t bought any for a while and even though gold is rising I haven’t had to sell any to rebalance either. This is because the significant new money entering my portfolio has been deployed elsewhere which has had the effect of pseudo rebalancing my portfolio by contributing to the holdings that were furthest away from my nominal target. - August and September 2010 inflation is extrapolated from the retail prices index (RPI). Hi RIT, I think we've had this conversation before, but your two graphs show it very nicely. As you have been lucky/prudent enough to acquire a holding in gold, it seems to me your current strategy is absolutely right. I have none and do not intend to buy at these levels. It seems likely, however, that gold will rise further before it falls. At what price point would you consider further rebalancing by selling? -SG. I would not say I have been lucky to acquire gold and would definitely say it was prudent. I conducted plenty of research and bought physically backed gold ETF's versus general commodities which are based on futures prices to prevent contango damaging my returns as I detailed here http://retirementinvestingtoday.blogspot.com/2010/04/investing-mistakes-ive-made-contango.html Additionally I picked gold as the correlation between Real Gold and the Real S&P500 is negative at -0.3. This gives me belief that going forwards it will help squeeze some performance as while one is zigging (maybe I'm selling due to overvaluation) the other will be zagging (maybe I'm buying due to undervaluation). With my gold holdings I am not making decisions based on price and am simply following a strategic asset allocation targeting a holding of 5%. I would look to rebalance if my allocation moved by 25% so a holding of 6.25% or so. This is obviously in stark contrast to my equity holdings which is based on strategic asset allocation but with tactical allocation bolted on top based on valuations as defined by the cyclically adjusted PE ratio. Of course only time will tell if I was right to hold gold.